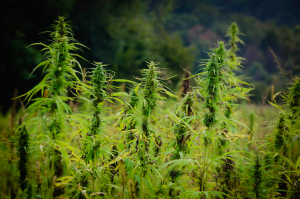 Nikki Lastreto and Swami Chaitanya, longtime residents of the country’s marijuana harvesting mecca, continue their historical breakdown of how the area evolved from an underground hippie haven to cannabis cash cow. In our last entry about the founding years of the famed Emerald Triangle, we observed the development of a culture of outlaw cannabis farmers living in the mountains of Mendocino, Humboldt, and Trinity Counties in Northern California. They were young hippies who left the cities to grow their own marijuana, settle down in the lush region, and have children who attended local schools, where their parents were sometimes the teachers. They shopped in the small towns that dot the region, and so became part of the community, while creating their own as well. During the years leading up to medical legalization, when CAMP (Campaign Against Marijuana Planting) and the feds ruled the skies with their helicopters, things were tense and paranoia was everywhere in the Triangle. Every year, especially around harvest in the fall, raids would happen on growers. Plants would be cut down. Choppers dragging huge nets full of plants would be seen flying away. Truck armadas, laden with green plants from destroyed grow sites, had the nerve to drive right through town, parading their stolen prizes. There has been an ongoing war in the area since it became a cannabis epicenter, with the old-timers and hippies squaring off against the law. To escape police persecution, some farmers began to rent or build houses in the mountains to grow marijuana indoor under lights. They would put children’s toys out in the yard as camouflage decoys and move them every day or so to make it look like a family lived there. Others bought shipping containers for growing, which were sometimes buried underground. Of course, this necessitated the use of generators, whose heat, noise, and fuel needs made them detectable. It wasn’t long before farmers realized that they could grow indoors in the city and be more hidden in industrial zone warehouses. Pacific Gas & Electric probably didn’t mind the profits they made from high intensity lights and air conditioners in grow rooms, though. The War on Drugs has simultaneously been unsuccessful and successful, as well as the longest “War” America has ever fought. If the intent was to stop marijuana consumption, the result was the exact opposite: marijuana use has increased exponentially since Richard Nixon exacerbated the oppressive movement started by Harry Anslinger’s anti-pot crusade, and cannabis consumption (on top of legalization) is still spreading like wildfire. But during the salad days of The Emerald Triangle, front page news of busts were a very potent form of advertising. If people were willing to go to jail to smoke this stuff, it must have been pretty damn good. It is stating the obvious that the whole industry thrived on being illegal. The risk plus demand, as well as small supply, created an artificial shortage and jacked up the price in the late ’90s to over $5,000 a pound. If the street price was $400 an ounce, it was worth the risk to grow, carry, or sell the wondrous plant. The pirate nature of the trade undoubtedly inspired the glamour surrounding it, while the police raids created the scarcity. And since illegality raised the price, a lot of people made a good living at the time. But then so did law enforcement. The “War” was extremely lucrative for all law enforcement agencies in on it, all across the country. Billions of dollars went to hiring officers, buying equipment, weapons, and vehicles including helicopters. Enforcement agencies also made money from asset confiscation. Likewise, private prisons expanded and were increasingly filled with convicted nonviolent drug offenders, and the Prison Guard Union became a powerful player in politics. Of course, many lawyers made a good living protecting the growers, dealers, transporters, and smokers, too. By the late ’90s, however, there seemed to be a kind of gentlemen’s agreement, at least on a county level, to live and let live within The Emerald Triangle. The sheriffs had to bust some people, usually the most egregiously outrageous growers, to keep their jobs. But local law enforcement didn’t have to make so many arrests as to kill the industry that was keeping everyone in The Emerald Triangle, not just the farmers and sheriffs, fat and happy. Over the years, there seemed to be about a three to five percent arrest rate among growers, but many would eventually come back to the biz. Underground folk wisdom was that if you were growing fewer than 100 plants, the feds weren’t interested; it wasn’t worth their time. A number of “culprits” were arrested numerous times, though. Almost every grower family up here has had a bust at one time or another. Some years were worse than others, depending on political and budgetary changes in Sacramento, the state capital, and in Washington, D.C. Things loosened up in 1996 when Proposition 215 (the Compassionate Care Act) was passed which made medical marijuana accessible, if not quite legal. Prop. 215 changed the atmosphere, so to speak, but the state did not issue any regulations. Thus was born the so-called Miracle Ounce. The patient was guaranteed his or her right to have a doctor prescribe the medicine, but the grower, transporter, and dealer were still in legal limbo, not criminal exactly, but with an “implied defense” against prosecution and persecution. After the legislature passed Senate Bill 420 in 2003, it got even looser, as the language set up a State Cannabis ID program. More importantly, it established a qualified right to form collectives and cooperatives, again without setting any guidelines. Finally, in 2010, then Attorney General Jerry Brown, issued his famous Attorney General’s Guidelines, laying out a framework for cultivators and dispensaries. As a result, growers in the Triangle would gather a number of medical scripts from friends to legally be able to grow six plants per script. For the first time, people began to grow in full sun, like it has been done since time immemorial everywhere else in the world. That was exciting! Out from under the manzanita bushes at last! Each county had its own limits on how many scripts could be used per farmer or outlawed it altogether. As always with cannabis, the laws kept changing. With the movement towards legalization in the aughts, new people migrated to the Emerald Triangle to try their hand at growing. Soon the price started to drop as a glut came on the market. By 2004, just five years from the peak, the pound was down to $3200. The Cannabis Green Rush was on the wane for the outdoor growers in the mountains, while the sparkly bling of indoor weed was taking over the market and commanding the highest prices. The easy days of growing weed in the Emerald Triangle were fading away. Even though new growers still flocked to northern California to stake their claim, prices were dropping quickly, while approaching legalization and all the questions around that were looming. The old days in the shadows were fading away as sungrown came into the light, and changed the area forever. Check out Nikki and Swami’s third and final installment of their behind-the-scenes Emerald Triangle tales. Then, check out MERRY JANE, and get to know the cannabis movement through their informative, engaging content. This piece was originally published on MERRY JANE on August 29, 2017.